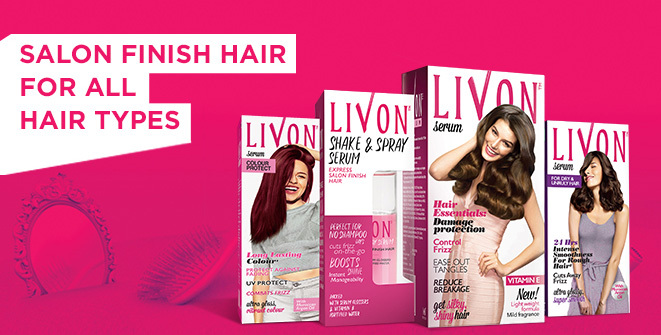 Livon Shake & Spray Serum is a one-of-its-kind product that gives salon finish hair on-the-go! We know you spend time doing up your hair every morning but by the time you reach office or college, aren't you shocked at how frizzy and messy your hair looks?This is why we made Livon Shake & Spray Serum! A spray which can easily be carried in the bag, it has Vitamin B fortified water & serum glossers that give you fab hair whenever, wherever. All you need to do is just shake & spray on dry hair to cut away the frizz and get instant smoothness and gloss! Livon Colour Protect Hair Serum with UV Protect & Moroccan Argan Oil is designed especially for your coloured hair. Don’t you just love our colour but hate how fast it fades? In just a few washes and thanks to the sun, colour fades quickly leaving your hair looking oh-so -dull! Flaming red ends up becoming a dull brown or gold starts looking like faded yellow in just a few weeks. Introducing Livon Colour Protect Serum. Use Livon Colour Protect Serum every time you wash your hair and right before you step out in the sun. What do you get? Longer lasting, salon-like colour that looks as vibrant as it did on Day 1! Livon Serum for Dry & Unruly Hair has been specially crafted for dry, rough & excessively frizzy hair which is unmanageable & so hard to control! Enriched with rich Moroccan Argan Oil extracts, Livon Serum for Dry & Unruly Hair moisturizes hair intensely but without any limpness, cutting away all the frizz, bringing back volume control and giving intense smoothness that lasts for 24 hours! Just apply a few drops on towel dried hair and feel your hair smoothen even as it dries. Livon Serum for Dry & Unruly Hair - get intense smoothness that lasts an entire day.